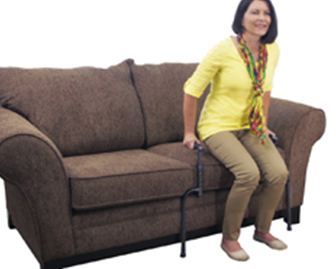 A rigid frame that can be inserted underneath couch cusions to provide a user a place to push off of to help get into standing. Great for people that have difficulty with transfers or muscle weakness. 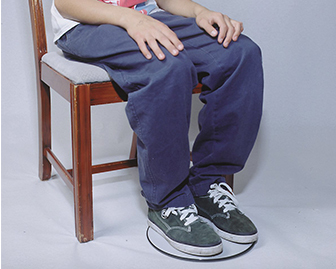 A fairly flat turning disc that someone stands on and can have their body’s turned easily to sit at an adjacent surface or chair. Great for people that are able to stand but need assistance from someone else with turning their body. 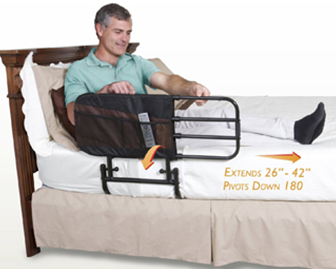 This bedrail is adjustable and can shift in position along the bed to allow one to use it for support to get in or out of bed. Also comes with an organization pouch to hold a TV remote, mobile phone, tablet and other items. 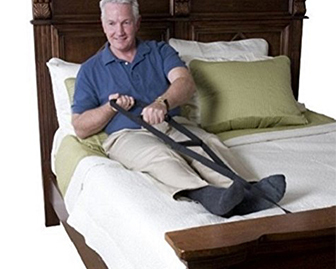 A strap that is generally connected to the foot of the bed that one can pull on to go from a lying down position in bed to a sitting up position. Great for those with decreased strength and endurance that have a strong ability to pull. 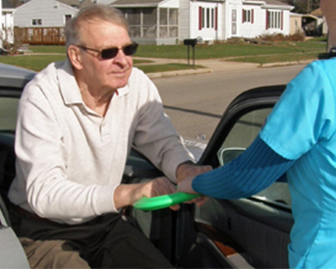 A special circular band that stretches slightly that a user can hold onto while a caregiver pulls on the opposite end to help propel the user into a standing from a seated position. Great for those with decreased endurance that need help to stand. 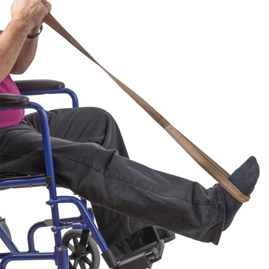 A long strap that a leg can be looped into to be help lift it. Great for people that have good upper body strength, but difficulty lifting their lower body into bed. Commonly used after a hip surgery.